The 'tampon tax' is a tax on women's healthcare items such as pads, tampons and menstrual cups. The lawsuit, filed this month in the Ohio Court of Claims, seeks to end the collection of a sales tax on feminine products and require the state to refund taxed women at least $11 million per year. 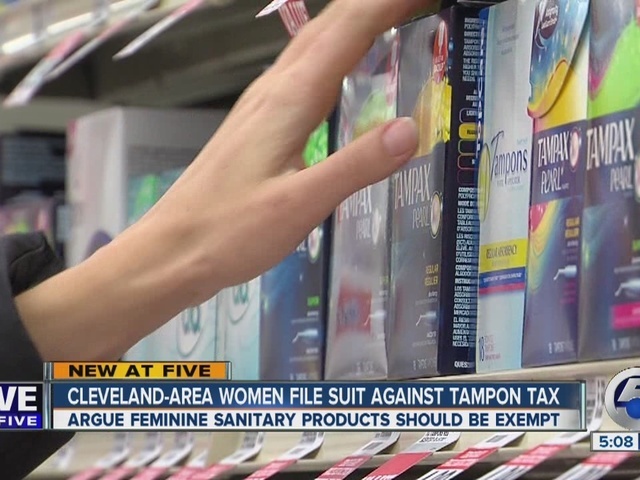 "A tax on tampons and pads is a tax on women," the lawsuit, which was filed on behalf of four Cleveland-area women, claims. "The "Tampon Tax" is irrational. It is discrimination. It is wrong. Defendants should be required to follow the law, and return the many millions of dollars they took illegally at the expense of women's health." READ THE ENTIRE CLASS ACTION COMPLAINT HERE. Under Ohio law, products essential to human health--including drugs, prescriptions and durable medical equipment--are exempt from the sales tax. The lawsuit was filed as local legislators work to eliminate the tax. Last summer, democratic lawmakers announced plans to eliminate the 'pink tax,' saying it is "an additional burden placed on women that intensifies the gender wage gap and makes preventative healthcare for women more expensive." “We are pleased to see action being taken against discriminatory laws that disproportionately single out women at cash registers all across the state," said Summit County lawmakers Greta Johnson (D-Akron) and Emilia Sykes (D-Akron) in a joint statement Monday. "This sales tax on essential products – that help prevent diseases and health complications – only affects women, instituting yet another unfair economic barrier to full equality. At a time when Ohio women are fighting for equal pay, job opportunities and access to quality health care, we need to strike down and get rid of systemic economic inequalities that put females at a disadvantage from the day they are born in Ohio."